"The latest novel in the series with the “sexiest, baddest, hottest”* outlaws around, from the New York Times bestselling author of Claimed. The last time Reese fell for the wrong man, she had no choice but to kill him. Now, she desperately wants to take what both Rylan and Sloan are offering. But if she makes the wrong call again, she risks losing them both." This series is so ridiculously steamy and I cannot wait for this next installment! 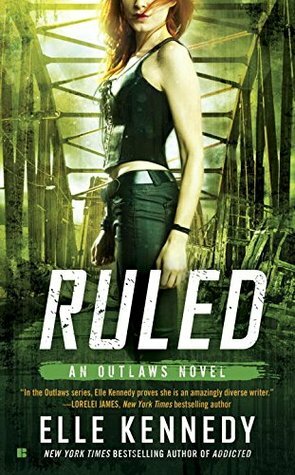 Ruled will be released on November 1, 2016. Nice pick! that's a totally new to me one! Hope you enjoy this installment once you read it! I need to read Elle Kennedy. I don't know why I haven't...just too many books I guess. Hope you enjoy this one when you get around to it. Oh my who is she going to choose? Part of me wants her to pick Sloan, the other guy not so much. I love Elle Kennedy's writing! Killer Instincts and Off Campus books. I have yet to read this series though. Hopefully, you'll enjoy reading it and I'll get to it soon! I need to start this series, I've heard it's amazing! Love that pick! Really like the cover as well. New Bloglovin' and GFC follower here. I love Elle Kennedy! Thanks for spotlighting this one. My Waiting On Wednesday is here, if you'd like to stop by!